In our series promoting health awareness, Kate Chapman takes a closer look at prostate cancer and meets one man who is working with his farming community to improve their understanding of the condition. Prostate cancer is the most common form of cancer for men across the UK, with more than 47,000 new cases diagnosed each year. Break down the figure further and this equates to 129 new diagnoses every day. In the UK, about one-in-eight men will get prostate cancer during their lifetime, while for some the risk is even higher depending on their age, ethnicity, family history and lifestyle. Each year the disease claims the lives of 11,000 men, while there are currently more than 330,000 living with and after it. Only men have a prostate gland who are affected. Usually the size and shape of a walnut, it grows bigger as they get older sitting underneath the bladder and surrounding the urethra – the tube men urinate through. The most common prostate problems are an enlarged prostate, prostatitis (an infection or inflammation of the prostate gland) and prostate cancer, which develops when cells in the prostate begin to grow in an uncontrolled way. Prostate cancer usually grows slowly and sufferers may not show any symptoms initially. They only manifest when the prostate is large enough to affect the urethra, and when this happens a man may experience an increased need to urinate, straining while urinating and a feeling that the bladder has not fully emptied. Dr Kevin Hill, a GP and chairman of South Lincolnshire Clinical Commissioning Group, says if men experience any of these symptoms it does not mean they have prostate cancer, but they should still visit their doctor to get checked out. The causes of prostate cancer are largely unknown but it mainly affects men over 50, with the risk increasing as they get older, while those who are overweight are at greater risk too. Ethnicity is also a factor – with one-in-four black men getting prostate cancer at some point during their lives. Those with fathers and brothers who have it, and, or mothers and sisters who have had breast cancer are also more likely to develop prostate cancer themselves. However, Dr Hill says there is no increased risk of prostate cancer for farmers. “There are some papers indicating farmers are at a slightly increased risk, working with pesticides and diesel fumes, but the jury is still out. If there is any increase, it is very, very small; the evidence at the moment is not convincing enough to indicate any increased risk,” he says. When it comes to preventing prostate cancer Dr Hill advises following a good, healthy diet and taking regular exercise and, if working with chemicals, follow the necessary safety guidelines and procedures. “Any symptoms affecting the waterworks, such as difficulty going, waking often at night to go to the toilet or going more often, should all be checked out. "Even if you have these symptoms it does not mean you have cancer – most of the time these things are down to an enlarged prostate gland,” he explains. “The commonest age for diagnosis is between 65 and 69, and anyone who has any concerns should go and see their GP. There is no single test for prostate cancer but completing a PSA blood test measures certain protein levels, which if raised, can indicate a prostate problem. Physical examinations, biopsies and scans can also be used to help detect it and GPs will advise patients which are necessary on an individual basis. When it comes to treatment, there are many available, which again doctors will advise on a case by case basis. If the cancer is at an early stage and not causing symptoms, a policy of ‘watchful waiting’ or ‘active surveillance’ may be adopted, to monitor it. Some cases can be cured if treated early by surgically removing the prostate or undergoing radiotherapy and hormone therapy. Some men have prostate cancer which is more likely to spread and this will require treatment to stop it spreading outside the prostate. As prostate cancer usually progresses slowly, men can live for decades without symptoms or needing treatment. Nevertheless, it can have an effect on their lives – both physically and mentally. Some patients may find it beneficial to talk about the condition with family, friends, a family doctor and other men with prostate cancer. For more information, research and advice visit Prostate Cancer UK at www.prostatecanceruk.org or calling 0203 310 7000. "I JUST KNEW SOMETHING WASN'T RIGHT." Smallholder and landscape gardener Chris Thompson was diagnosed with prostate cancer six years ago when he was just 52. Despite showing none of the typical symptoms of the disease Chris (now 58) knew something was not quite right, so went to see his doctor. He made several visits and underwent a number of tests before he was diagnosed in November 2012, when he was told his prostate cancer was contained and just about to break out, but had thankfully been caught in time. Chris, who lives in Kerridge, Cheshire, started a two-year course of hormone therapy to help shrink his cancer and in March 2013 underwent a sophisticated type of robotic surgery – high dose rate brachytherapy – which involved targeting his prostate with different rates and strengths of radium simultaneously. Two weeks later he had the first of 20 rounds of external radium therapy. “I’ve always been pretty fit, playing squash, football and going to the gym," he says. "I’ve a good understanding of fitness and know my body, I didn’t have any particular symptoms, I just knew something wasn’t right,” says Chris, who keeps sheep and chickens on the eight-hectare (20-acre) smallholding he looks after with wife Carolyn. "I went to see my GP five times before I was diagnosed, on each occasion they were very thorough but crucially didn’t do a PSA blood test until my final visit. “It’s an indicative blood test and provides an indication something may be wrong, it is not, however, a specific test for prostate cancer. “Luckily my cancer was caught in time and I had surgery the following March. I had no time off work; I walked into hospital on the Sunday afternoon, had the procedure on Monday and walked out Tuesday, straight back to work. On a personal level I had no pain, and after that just got on with life. 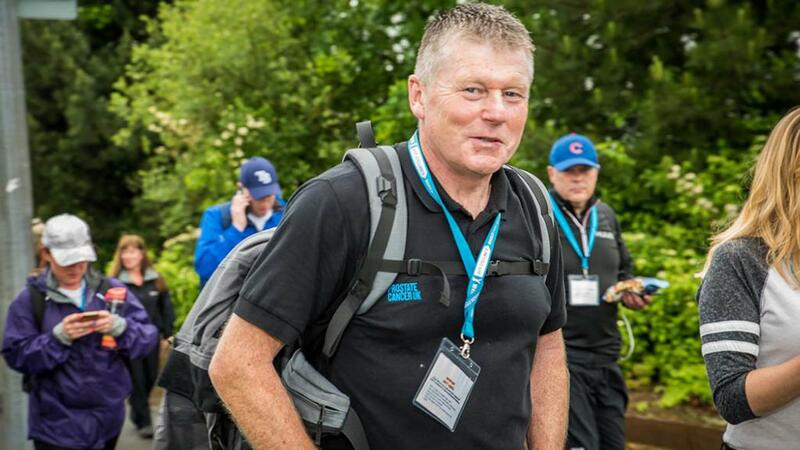 Chris continues to have his PSA levels closely monitored and has since started working for Prostate Cancer UK, raising valuable funds for, and awareness about, the condition in his own rural community. Last year a Name the Lamb campaign he worked on raised £6,000 and is being repeated this year, where members of the public can pay £5 to name a newborn lamb. “The farming community is a big target audience for Prostate Cancer UK – speaking generally rural communities can be a little insular. Some of the typical people there live through aches and pains every day and are resistant about going to the doctors and don’t want to trouble them.